A short and sweet post today. This is one of my favourite football stories, and, as the festive season approaches, it had to be told! Until the 1950s, it was very common for a full league programme to be played on Christmas Day in England, something we would never think of in the modern era. Many of you know that I’m a passionate football fan, and I very much enjoy writing about the Beautiful Game. Over the past decade or so, I have become increasingly fascinated by the history of sport, and of soccer in particular. I wanted to write more on the subject, but felt Another Kind Of Mind was not quite the right space for that. Instead, I started something that is. And Still Ricky Villa… is a blog about football. All sorts of football – everywhere and everywhen. And it’s not just me who is involved – we’d love to hear from football fans who would like to write for us in the future. Have a look here for more details if that sounds like you. So far, we have mostly covered World Cup stuff, but there are a number of new posts in the pipeline, including pieces on the strangeness of goalkeepers, the new Spurs stadium (of course), and lots of spooky stuff for Halloween (seriously, you’d never believe the number of major football clubs that claim a resident ghost or two!). We welcome writing and images from fans of all clubs, anywhere in the footballing world – we’re here for the game, not the rivalries. If you’d like to contribute to And Still Ricky Villa, feel free to get in touch! You can find loads of ideas for articles here, or pitch us something over on our Twitter account. As with many things in life, I came across this somewhat bizarre little newsreel clip while I was looking for something else entirely (I was actually searching YouTube for videos of football being played in extreme weather – you can find my playlist of that here). When I saw this frankly odd snippet of film, I couldn’t resist posting it here for your enjoyment too! Since we are in the midst of the Rugby Union Autumn Internationals and the Rugby League World Cup (England have reached the final! ), it seemed like the perfect time to share this quirky look at what has to be one of the most unpleasantly cold and uncomfortably violent crossover sports imaginable (and I’ve played actual rugby. In the actual mud). Filmed at the Streatham Ice Rink in south London (I honestly can’t see this type of game being played on the beautiful green reaches of the Twickenham pitch! 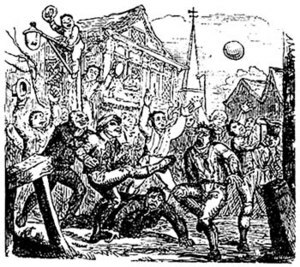 ), and, according to the narrator “a mixture of rugby and American footer”, this 8-a-side match between the Senators and the Royals doesn’t actually seem to have much in the way of tactics going on – unless you count falling over in a heap and shoving the opposition off the ice at 25mph as tactical play! Usually, my Playlisting posts involve music, but this one is a little different. Today, we’ll be overrun by pine martens on the pitch, alligators and capybaras on the golf course (not at the same time, obviously), and sheep on the football field – plus a demonstration of the need for goat line technology, an invasion of plastic pigs, psychic octopi, the penguin cup final, various avian pitch invaders, cats with a fascination for ball games, and lots and lots and lots of dogs. Dogs love football. And we all love a dog on the pitch. If you know of any sporty animal videos that can be added to the playlist, post a link in the comments or tweet me! Today’s vintage film clip is from British Pathé, and is a fascinating glimpse into the world of football fifty years ago. With England playing Iceland in the Euro ’16 round of sixteen tonight, I thought it might be fun to have a look at some real English footballing success from the past. So we’re heading back five decades to the year England won their one and only World Cup. We start with a brief look at how the World Cup footballs were skilfully made (mostly by hand, in Yorkshire) and continue with some great colour footage of the final itself, then some newsreel footage of the players being feted afterwards. And, of course, we get a glimpse of the legendary Pickles the dog, who found the World Cup in a hedge after it had been stolen a few months before the competition started. Today is the opening day of the football European Championships in France and I’m quite excited. Indeed, I’ve got my fixtures wallchart ready and am planning my match predictions as we speak. One reason I’m quite excited by all this is that my team, the mighty Spurs, have sent a whole eleven (count ’em!) players to Euro ’16 – including five who are in the England squad – which, after the highly dramatic season we just had, is absolutely as it should be! Watch out for more vintage football-related posts coming soon. The best World Cup song ever? And it sounds great in the sunshine.